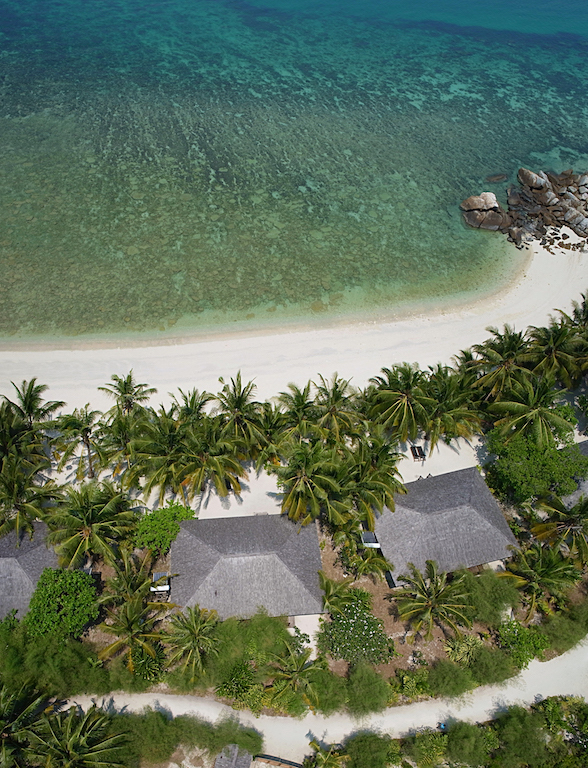 Batu Batu has 20 one-bedroom villas and 2 two-bedroom villas, each constructed from tropical hardwoods and designed to blend in with the natural surroundings. Inspired by Malaysian architecture, the villas feature high roofs and large glass doors opening to a spacious balcony facing the sea or the jungle, providing privacy and tranquility. The bathrooms are spacious and well equipped with stonewashed bathtubs, showers, toilets and double sinks with wall-to-wall windows opening on to the sea or jungle views. Set on an elevated point looking down on the ocean and the resort, this villa has a large loft-style bedroom with king bed, a living area with two day beds, and a large private balcony with elevated views of the sea and the swimming pool. The two day beds can be made-up for sleeping and the villa also has a children’s annexe. Similar in layout to the Jungle Villa, the Ocean Villas are usually set on higher ground with elevated views of the ocean. These villas have one bedroom with a king bed and mosquito net, a day bed which can be made-up for sleeping, a large bathroom with stand-alone bathtub and shower and a private balcony with views of the sea. Some villas also have a children’s annexe. Set on the island’s Sunrise Beach, these villas have one bedroom with a king bed and mosquito nets, a day bed which can be made-up for sleeping, a large bathroom with stand-alone bathtub and shower and a private balcony with direct access onto the beach. All of these villas also have a children’s annexe with bunk bed and they are the most popular villa type for families travelling with children given their beachside location and proximity to the main resort facilities. Set back from the coast on higher ground at the fringe of the island’s tropical forest, the Jungle Villas come with one bedroom with king or twin beds and mosquito nets, a day bed which can be made-up for sleeping, a large bathroom with stand-alone bathtub and shower and a private balcony with sea views. Some villas also have a children’s annexe. Located next to the resort’s swimming pool and main restaurant in the heart of the resort, these villas have two smaller-sized bedrooms with king or twin beds, two outdoor bathrooms and a covered living area situated on a spacious veranda. The two bedrooms are positioned right next door to each other and have interconnecting doors making them suitable for families. Given their central location, these villas offer easy access to the restaurant and pool but have less privacy than the other villa types. A majority of villas come with children’s annexes – small bedrooms for children leading from the main bedroom or bathroom with bunk beds, allowing parents the freedom to move around after they’ve put their children to bed for the evening. The children’s annexe is small (2m x 2m). Some villas are set further away from the main resort facilities and others are located just a few steps away. Some villas may not be suitable for guests with mobility issues or families with young children. All villas feature a DVD player, drinking water, tea and coffee making facilities, kettle, minibar fridge, standalone bath tub, rain shower, Malin + Goetz toiletries, hairdryer, in-room safe and solar hot water heaters.